This guide explains in detail the fastest possible way to train your Prayer by worshiping the Ectofuntus (commonly misspelled "Ectofunctus"). For this part you will need 1 Glory Amulet, Ectophial, 13 bones and 13 pots. When ready teleport to Ectofuntus, climb stairs and head to the bone grinder. Picture below shows you how you should do the grinding process. Use bones with the Loader. Wind the wheel to crush bones to dust. Empty Bin to fill pot with bone dust. 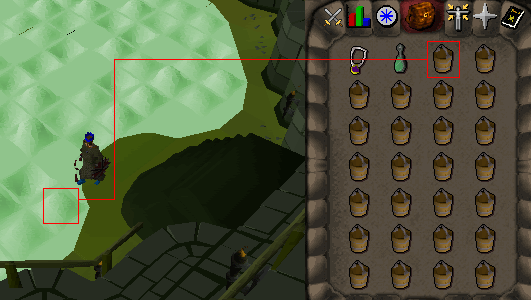 After you finish grinding all 13 bones rub your Amulet of Glory and teleport to Edgeville. 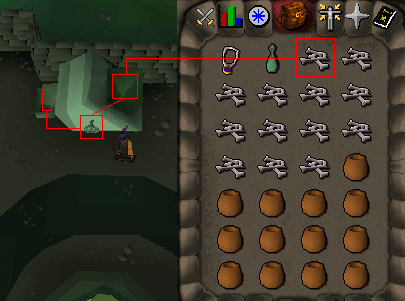 For this part you will need 1 Glory Amulet, Ectophial and 26 buckets. 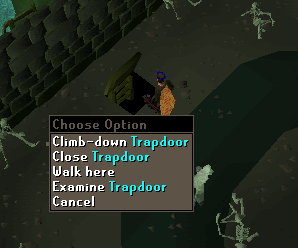 When ready, teleport to the Ectofuntus, open the Trapdoor and climb down. 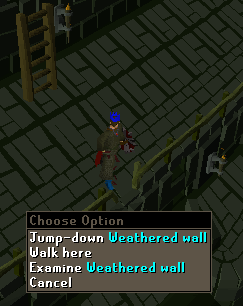 If you have Agility level 58 or higher you can use shortcut, if not you will need to go the long way. by climbing down the several staircases. After you come to the lowest level you will see a pool of slime. Look at the picture below to see how you should collect it. Step #1 - Use your buckets on the pool of slime. 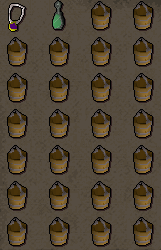 After you have filled 26 buckets, teleport to Edgeville. For this part you will need 1 Glory Amulet, Ectophial, 1 Ring of Duelling (used if you forget to swap uncharged Glory Amulets), Ghostspeak Amulet, 1 empty space (used for Ecto-tokens later), 12 bonemeals and 12 buckets filled with slime. When ready teleport to Ectofuntus and start worshipping at the Ectofuntus. 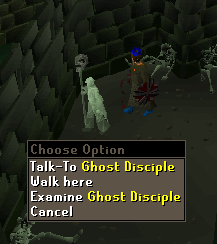 After you have worshipped all 12 bonemeals, talk to Ghost Disciple to receive your Ecto-tokens. 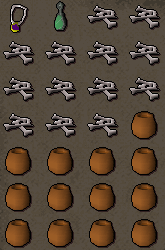 After you have done this teleport to Edgeville and repeat the process. You can use Rings of Dueling for teleport too, but when they run out of charges you can't recharge them. Grind all your bones and collect all slime before you begin worshipping. 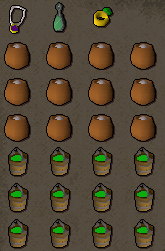 After you grind 100 bones, collect 100 buckets of slime. This way you won't get bored so quickly.